A memorandum from Felix Salvador, Chairman of the St. Johns River Advisory Committee, to Committee members and county commissioners of counties bordering the river. The St. Johns River Advisory Committee was formed under Governor C. Farris Bryant (1914-2002), and reactivated under Governor W. Haydon Burns (1912-1987), with the task of advising state and local agencies on aquatic pollution within the river. 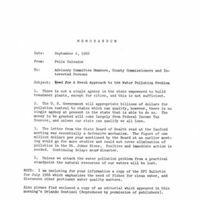 In this memo, Salvador stresses the need for an agency that is able to build and oversee sewage treatment plants above the city level. He also urges that a state agency be formed with the task of controlling pollution, thus allowing the state to qualify for Federal grant money. Photocopy of original memorandum from Felix Salvador to Advisory Committee and County Commissioners, September 2, 1966: binder 1966, Friends of Lake Apopka Archives, Ginn Museum, Oakland Nature Preserve, Oakland, Florida. Digital reproduction of photocopied memorandum from Felix Salvador to Advisory Committee and County Commissioners, September 2, 1966. Originally created by Felix Salvador. Wade, Evelyn. "Pollution Fight Urged For St. John's River." The Daytona Beach Morning Journal, December 7, 1966. https://news.google.com/newspapers?id=o28eAAAAIBAJ&sjid=p8kEAAAAIBAJ&pg=4661%2C1721935. Salvador, Felix. 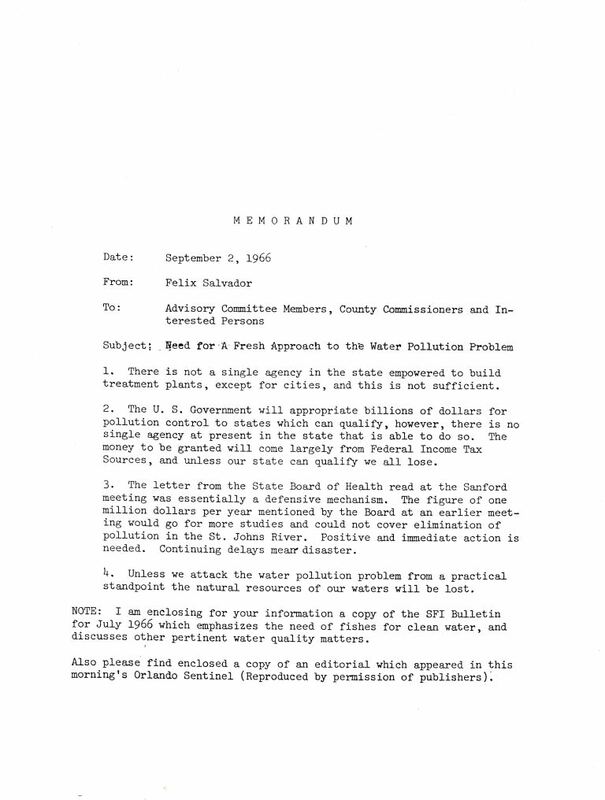 “Memorandum from Felix Salvador to Advisory Committee and County Commissioners (September 2, 1966).” RICHES of Central Florida accessed April 21, 2019, https://richesmi.cah.ucf.edu/omeka/items/show/6847.